The system of alternative medicine known as homeopathy was developed over 200 years ago in Germany. Homeopathic solutions are derived from plants, minerals or animals, and are often formulated as sugar pellets that can be placed under the tongue. The two main theories in homeopathy are "like cures like" and "law of minimum dose." A patient receives a substance that produces similar symptoms in healthy people, and that is substantially diluted. 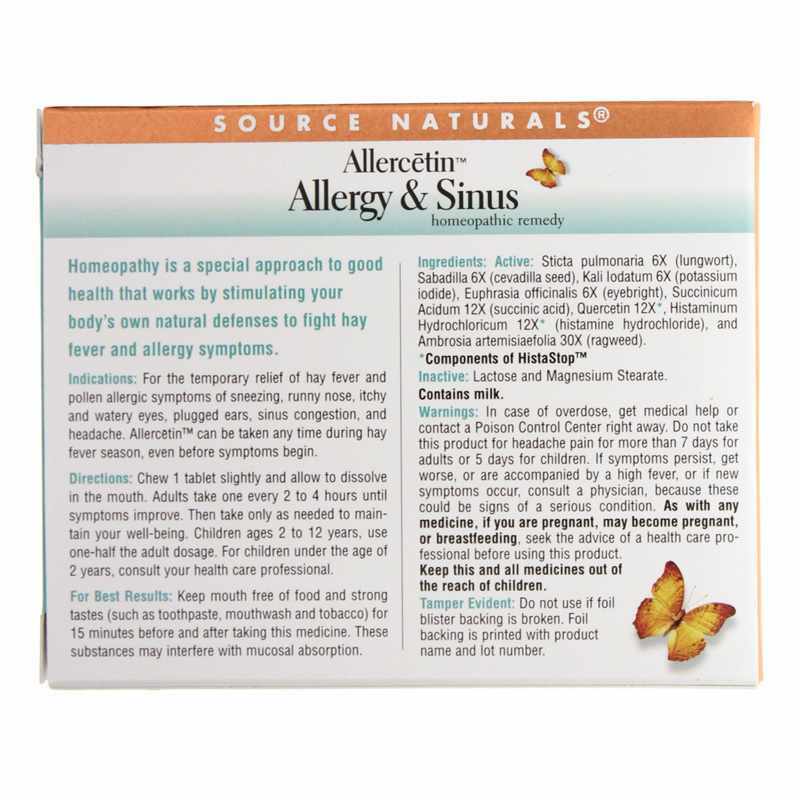 Source Naturals offers a homeopathic option for allergies called Allercetin Allergy & Sinus. It supports multiple body systems involved with hay fever. Allercetin Allergy & Sinus supports these body systems: the respiratory system, sinuses, mucous membranes, histamine inhibition, immune desensitization and cellular energy. 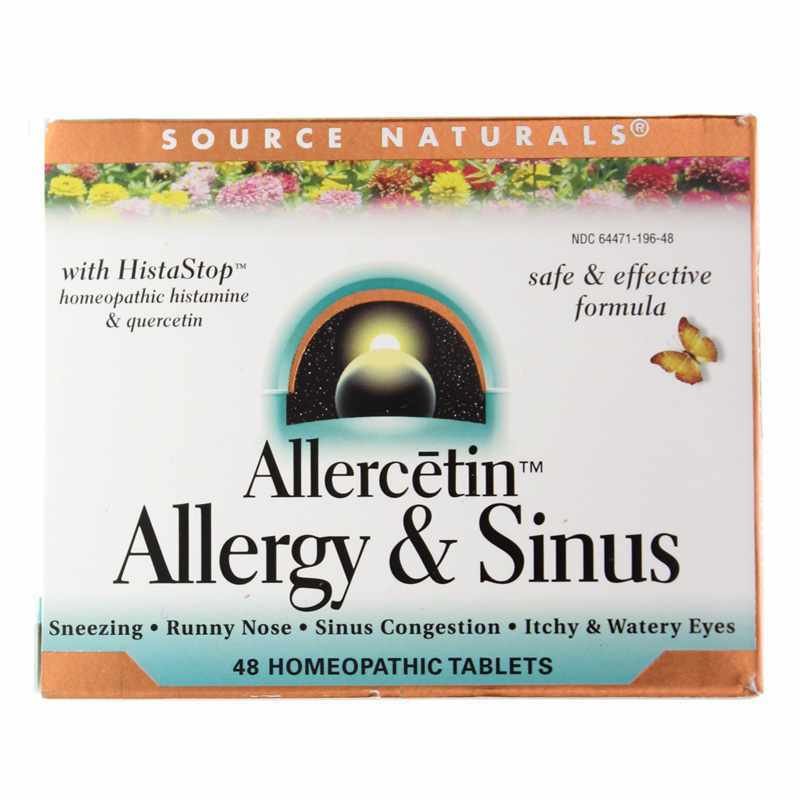 If you're looking for a homeopathic option for allergies, check into Source Naturals' Allercetin Allergy & Sinus. Order online today! Chew 1 tablet slightly and allow to dissolve in the mouth. Adults: Take 1 tablet every 2 to 4 hours, until symptoms improve. Then, take only as needed to maintain your well-being. Children ages 2 to 12 years: use one-half the adult dosage. Children under the age of 2 years: consult your healthcare professional. Do not take this product for headache pain for more than 7 days for adults or 5 days for children. If symptoms persist, get worse, or are accompanied by a high fever, or if new symptoms occur, consult a physician, because these could be signs of a serious condition. As with any medicine, if you are pregnant or nursing a baby, seek the advice of a health care professional before using this product. Keep this and all medicines out of the reach of children.